Around 11:30 a.m., fourth grader Karleese, 9, was given a vocabulary word he had never said before. “In-thoo-see-as-thic?” Karleese said as he hurdled each syllable of the word on his computer screen. Kaulia Powell assists her sons and students Karleese and Kahleeil. His mother Kaulia Powell, 37, coached from the end cushion of the couch where Karleese’s Wednesday English lesson was being held. While Karlese studied words like “zealous” and “convenient,” his older brother Kaheeil, 11, took a quiz on Roman numerals in the kitchen. Kahleeil, now in the sixth grade, sat quietly in the kitchen matching numbers with their Roman counterparts. 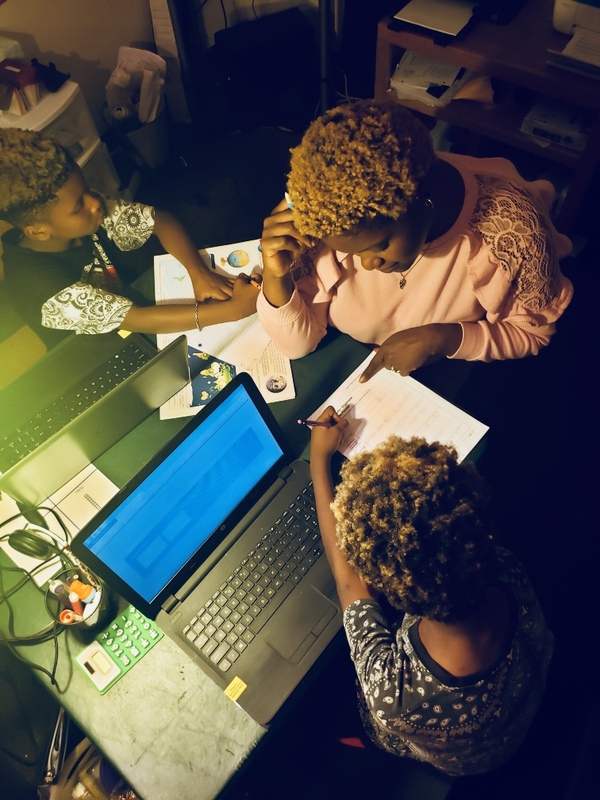 Kahleeil and Karleese are two of an estimated 202,000 Black students receiving a home-based, parent-led education in the United States, according to the National Home Education Research Institute (NHERI). The two brothers have not attended a traditional school since they were in kindergarten and second grade. After receiving calls from John Muir Elementary school about her sons’ behavior, Powell, a Madison native living on the Near West Side, decided to become more present in her sons’ education by visiting and volunteering at the school. Powell remembers receiving calls from teachers about her sons being distracting and temperamental. When Powell began volunteering, she said she noticed her sons being treated differently from their classmates. Shortly after Kahleeil told his parents about his experience with his music teacher, Powell and her fiancé Charlie Logan made the choice to educate their boys from home. “I did not want my children to be programmed to feel like they are going to be incarcerated,” she said. The Powell children are part of a growing trend of Black families opting to educate their children at home. Home-based education–or homeschooling–is not a new phenomenon. In 2016, the NHERI estimated there are 2.3 million students receiving home-based education in the United States. The transition to home-based education has been on an upward trend among many people of color around the country, especially Black families. Between 1999 and 2010 the percentage of Black students receiving a home based education nearly doubled, according to NHERI. Today, African American K-12 students are the fastest growing segment, reaching over eight percent of the homeschooling population, according to NHERI. In 2015, a study conducted by NHERI President Brian Ray explored the motives of Black families who homeschool their students. Providing religious or moral instruction; influencing the child’s values and worldview; and developing stronger relationships between children and parents were all top reasons listed among Black parents surveyed. Some parents also included student safety, avoiding racism in the schools and providing more cultural curriculum as reasons to homeschool their children. Although Brown v. Education (1954) is held up as the landmark case that ended legal segregation in schools, many question how the integration of schools has impacted the success of Black students. Johnny Justice, 36, and Marie Justice, 31, began homeschooling their four children after making the decision to embark on their entrepreneurial journey as filmmakers. The couple relocated to Madison in 2004 from Joliet, Illinois. Their reasons for homeschooling were simple: they wanted to spend more time with their children and wanted their education to be personalized to each child. Their children, Mariah, Mariella, Hallie and Bobby, all require different learning styles.The family’s decision to homeschool has allowed each child to learn in ways best for them while exploring their own passions. In Dane County there are nearly 1,000 students who are receiving a home-based education. There are many concerns surrounding homeschooled students’ socialization and their parents ability teach each subject. According to NHERI homeschooled students score above average on standardized tests regardless of the parents’ level of education. “Everything you need to know is technically in a book at the end of the day,” Johnny Justice said. “I can see that this opportunity to be homeschooled really allowed them to understand themselves and understand the world around them,” said Marie Justice, whose four children are enrolled in an array of activities ranging from baseball to violin. For Kaheeil and Karleese, who recently began playing football for the Southside Raiders, homeschooling has been enjoyable because they said their mom listens to them more than their past teachers. Education continues to be a hot topic as Wisconsin’s gubernatorial election approaches. For these families, home-based education has served as a way to give their children the education they’d like them to have. “We really enjoy our kids. That’s like 9 hours of the day that you’re not seeing your kid,” said Marie Justice. “And for those nine hours who’s the influence on your kids? Is it you? Or is it somebody else?” said Johnny Justice. This story originally appeared on Madison365.com. It was written by Kynala Phillips, a Black girl enthusiast, and a Journalism and Mass Communication student at UW-Madison. To be a Madison teacher is to exist within a set of irresolvable tensions. Some of them are comic: when the copy machine breaks down four minutes before students arrive at your classroom, do you rush to meet them, or stay to unjam your papers? During the primary campaign we asked candidates running for the Madison Board of Education the same five questions to understand their vision for education in Madison. For the general election, we took a different route and asked the candidates a set of questions to understand where and how they would focus their energy if elected. Madison Commons is brought to you by sponsorships from and collaborations with the following organizations.